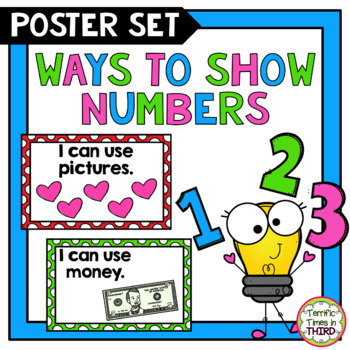 Use these posters to show students 12 different ways they can show numbers. 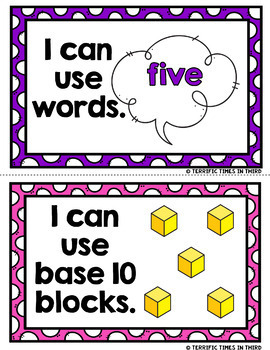 Perfect for your math word wall, math stations, whole group instruction, or small group work. 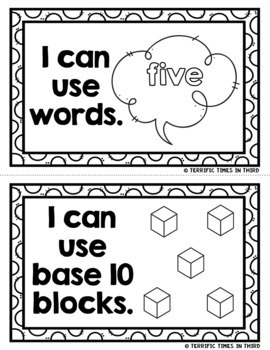 The posters use "I can" statements and are printed 2 to a page. All strategies are compiled into 2 different handouts. A heading poster "Ways I Can Show a Number"
"I can use tally marks." "I can use a ten frame." "I can use a number line." "I can use a number sentence." "I can use base 10 blocks." "I can use my fingers." "I can use a die." "I can use the digit." "I can use expanded form."